Lakota East’s Alex Mangold blocks the shot of a Dunbar player on Friday at Hillsboro High School where the teams competed in the 2018 Ohio Valley Hoops Classic. 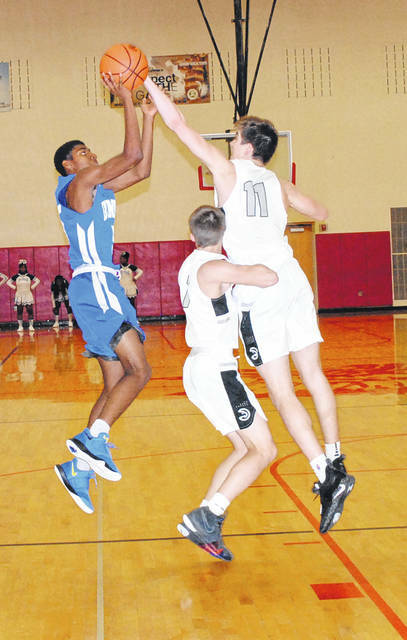 The Lakota East Thunderhawks and the Dunbar Wolverines opened the 2018 Ohio Valley Hoops Classic on Friday at Hillsboro High School and the Thunderhawks picked up the resounding 62-35 win. Lakota East used it’s smothering defense to keep the Wolverines on their heels for the majority of the game. Dunbar tried to be aggressive and attack the basket, but many of their drives were nullified by charging calls. Thunderhawks’ sophomore Nate Johnson was selected as the player of the game.